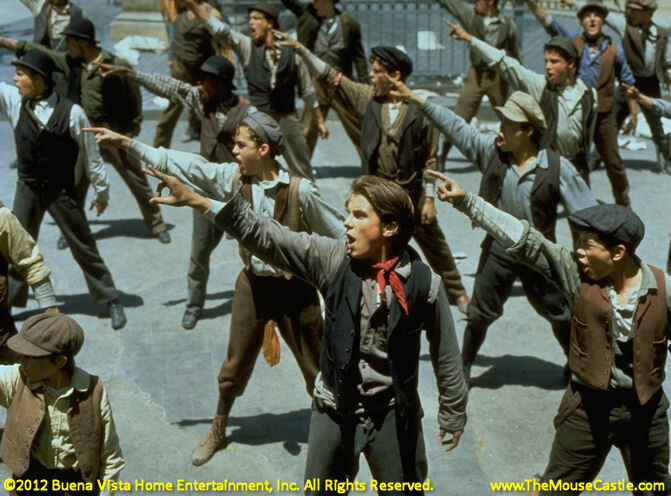 Without a lot of fanfare, Disney released its 1992 musical Newsies on Blu-ray this week. That's a bit of a surprise considering the current success of Newsies on Broadway (eight Tony nominations, two wins and a hugely popular open-ended run at the Nederlander Theater). Plus, it was home video that years ago gave the film new life and somewhat of a cult following after it failed miserably at the box office. You'd think Disney would be making a bigger deal about this 20th anniversary hi-def release. Newsies is a fun, if hit-and-miss, affair about a celebrated 1899 New York newsboys strike against lions of publishing Joseph Pulitzer and William Randolph Hearst. It's noteworthy for its cast of established actors and up-and-coming stars (Christian Bale, Bill Pullman, Robert Duvall, Ann-Margret, Michael Lerner). It also was the feature film directorial debut of Kenny Ortega, who would use his stagy, but energetic, let's-put-on-a-show musical approach to better use in Disney's High School Musical franchise. While it's every bit the family-friendly film it sets out to be, Newsies comes off as a bit too cleaned and polished for its own good. Cookie-cutter back lot sets and stereotypical street urchins right out of the Dead End Kids take the edge off what could have otherwise been a gritty big city tale of idealistic youth versus the greedy, corrupt establishment. Like Ortega's HSM movies, Newsies exists in an idyllic white bread vacuum that the real world wouldn't dare penetrate. Still, it boasts a catchy musical score by Alan Menken (with lyrics by Jack Feldman), who was smack-dab in the middle of his incredible run at Disney that included music for The Little Mermaid, Beauty and the Beast and Aladdin. "King of New York" and especially "Seize the Day" are two of the more under-appreciated uplifting tunes in the Disney canon. Watching the film, it's easy to see why Newsies was meant for the stage. It's full-screen choreography, complete with a plethora of jumps, high-kicks and flips, is crowd-pleasing fodder for a live audience. I was certainly entertained revisiting Newsies the movie after all these years, but it just made me want to travel to Broadway even more.